Chefchaouen is unlike most other places we have visited. 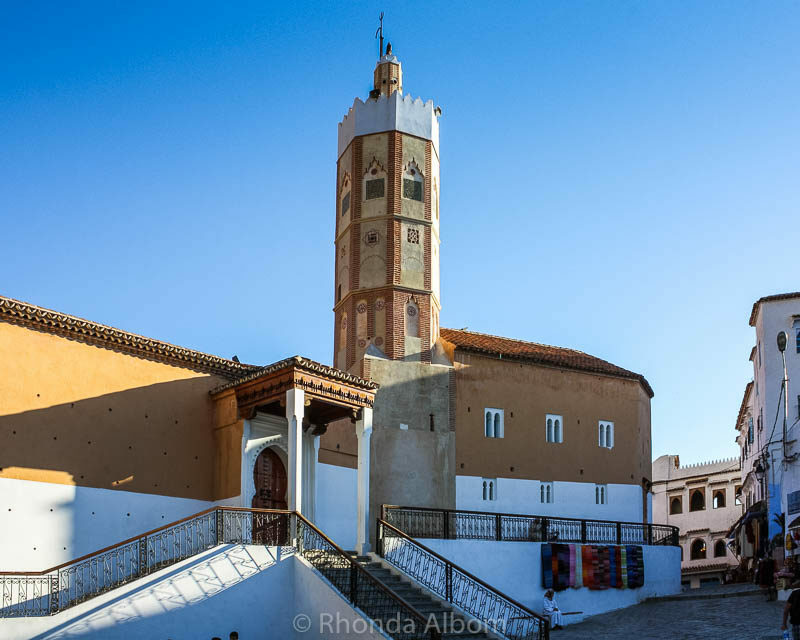 With a sordid, almost secret history, it’s a walled Moroccan city founded in 1471. A refuge and haven for Jews and Muslims during the Spanish Inquisition, Chefchaouen banned Christians (punishable by death) until the 1920s when it was temporarily captured by Spain. Today it is probably most known by its nickname, the “Blue City.” Wandering the streets, we clearly see where the name was derived. It’s so beautiful that I can clearly see why this is a classic, over photographed spot. 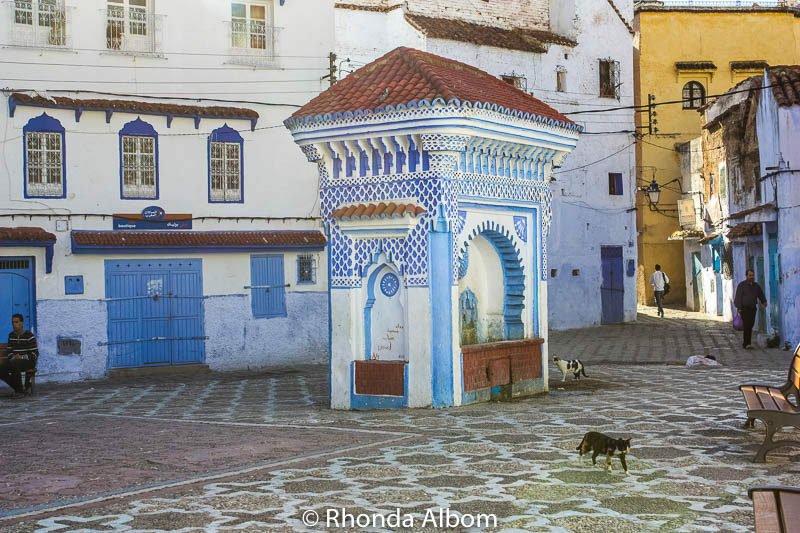 It was still early when I captured this shot of the main square in Chefchaouen. Later in the day all the cafe’s will be open, chairs and tables will be out, and there will still be cats everywhere. The satellite dish on the side of one of the old homes highlights the contrast of new versus old. As non-Muslims, we were not permitted to enter the Grand Mosque of Chefchaouen. Its octagonal minaret is somewhat unique. These stairs lead to Riad Dar Lbakal, where we stayed. If you look closely, you can see our girls standing at the rail on the patio just above the top of the stairs. 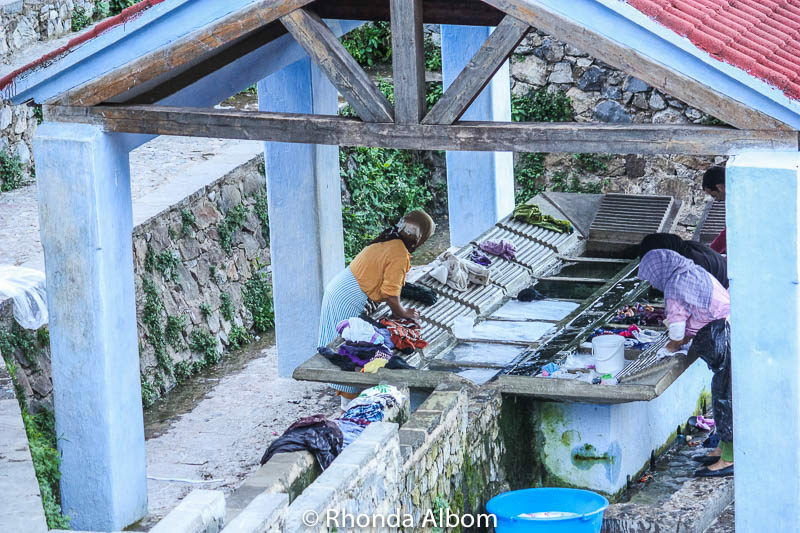 The women wash laundry in the local stream. Set up along the waterway is this workstation where they do the scrubbing. 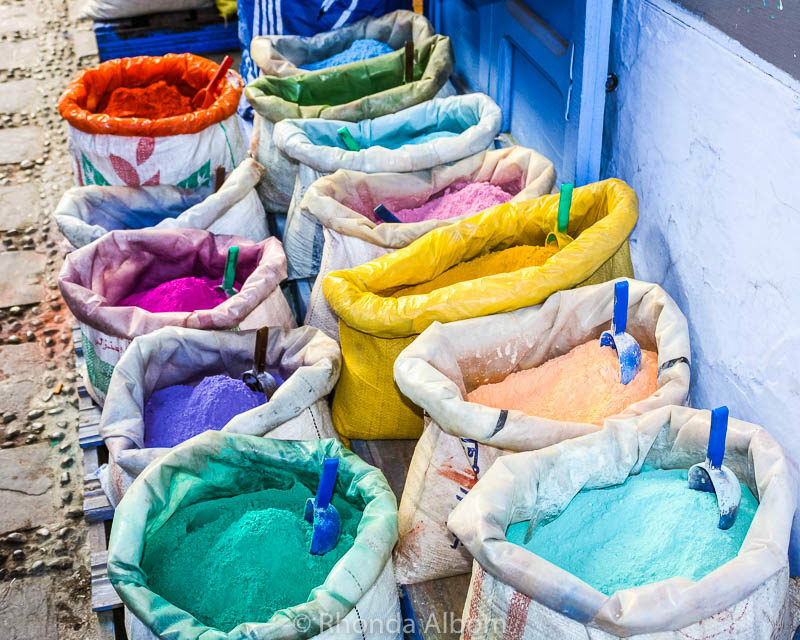 Paint pigment for sale in Chefchaouen: blue for the exterior, colours for the interior. 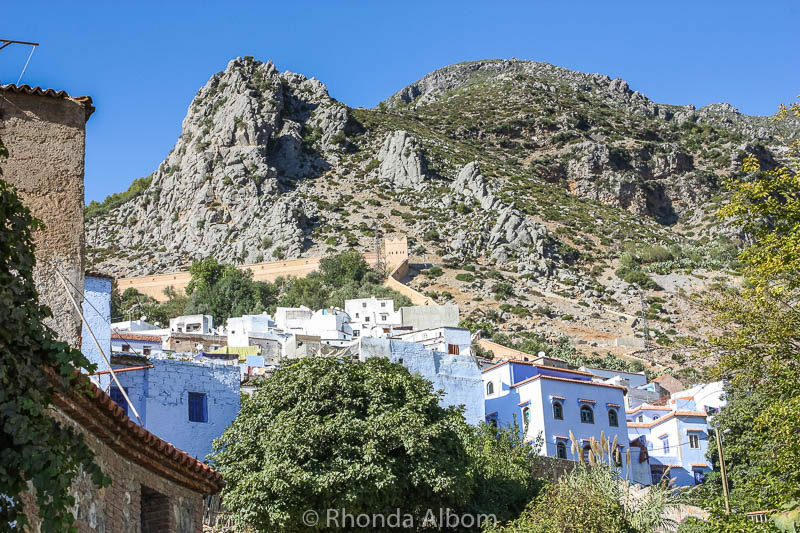 You can see the Chefchaouen’s city wall as it runs up through the Rif Mountains. Another mosque at the end of a narrow street. Located in the Rif Mountains, Chefchaouen is about 125 km south-west of Tangier and 200km north of Fes. I don’t remember why we opted to get a driver and guide rather than renting a car as we did in the Atas Mountains. 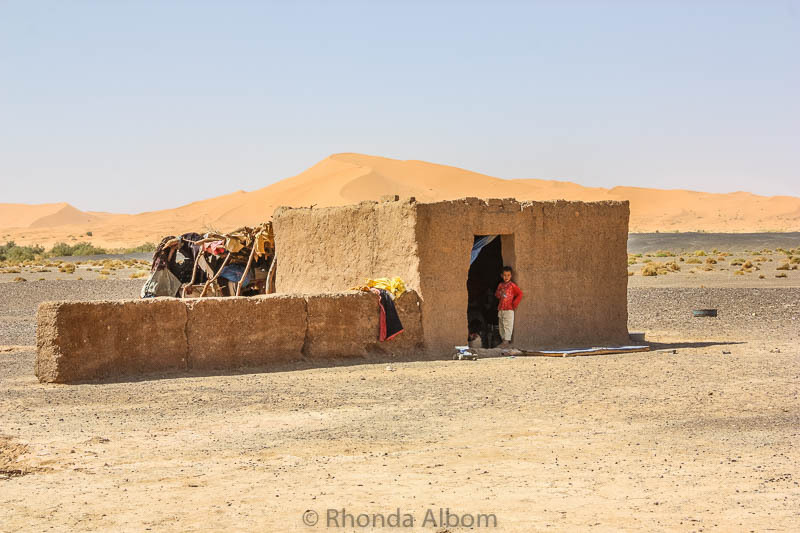 If we were to return, I am sure we would visit on our own, as we are comfortable driving around Morocco. To date, we have had great success renting with RentalCars.com, especially in non-English speaking countries, as their customer service is worldwide and English-speaking. We used a private guide and paid quite a bit for it as we wanted to stop at a waterfall in Akchour on the way back that was a 40-minute detour off the main road, and then quite a walk from the trailhead for a not very interesting adventure, mostly because after an hour of walking, the guide told us it would be another three hours to get to the waterfall. So we turned around. Total extra time was over 3.5 hours. Group tours are also a great option, especially if you don’t want to drive in Morocco. Chefchaouen is located in the only region of Morocco to have had malaria, although they say it is not a problem today. 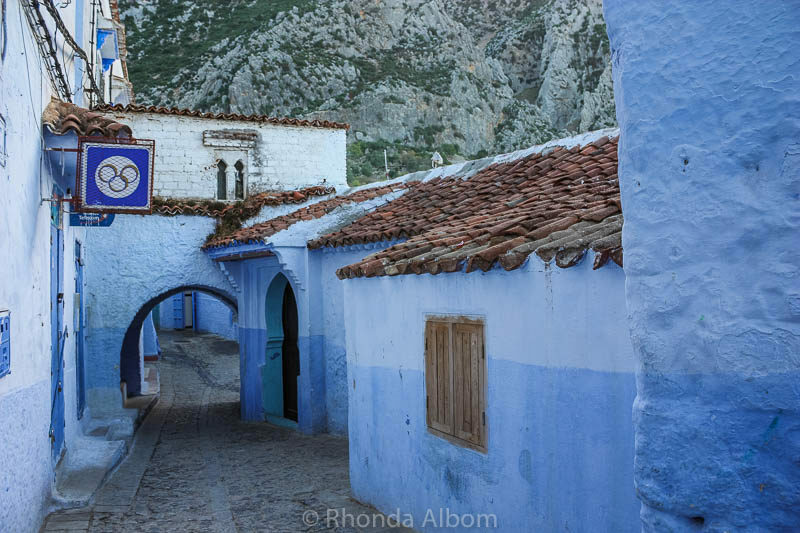 According to our guide (but I have not been able to verify this anywhere else), the Jewish people first painted it blue with the founding of Israel, and soon all the local Chefchaouen people discovered that blue kept the mosquitoes at bay. The region is also quite popular amongst the tourist sector seeking drugs. The Marijuana plantations in the surrounding hills drive this reputation. Unlike in Oregon where we went into a legal Marijuana dispensary, in Morocco, we steered clear. Have you been to Chefchaouen? What do you think of this “Blue City”? 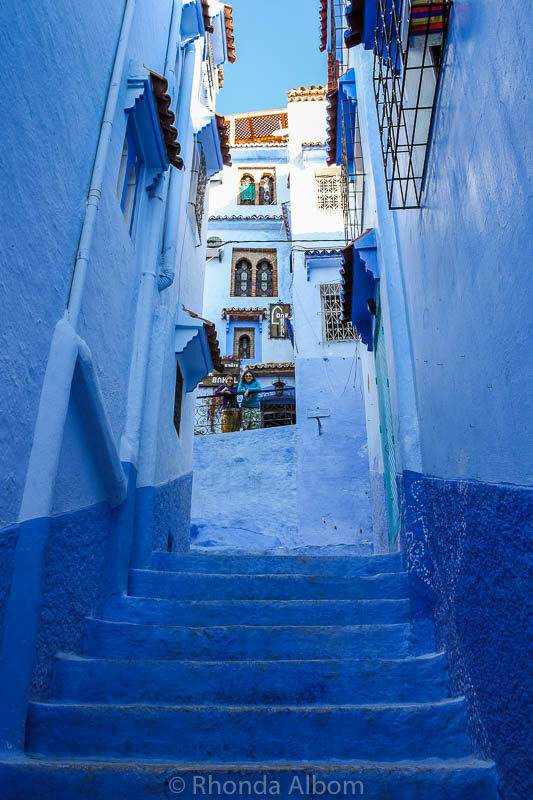 I hear a lot of great things about Chefchaouen. It looks amazing – and I hope I’ll visit it one day! Morocco is one of my favourite countries I have visited. Each city we went to was unique and special in its own way. Chefchaouen is amazing. I wish we spent more than just one night. Lovely photos. We have a blue city in India too! It is in Jodhpur. Blue colour apparently seems to ward off mosquitoes and other insects. It also helps keep the walls of the house cool. So cool. I had to Google Jodhpur to see all the blue. Thanks for letting me know. Interesting that we were both told different things as to why they houses are blue. Yes, it did have a strong positive energy. Do you think it was the blue? It is an easy place to find good shots. WOW, wow, and wow. We never went to Morocco and I wish we would have just for the color. These images are fabulous Rhonda. 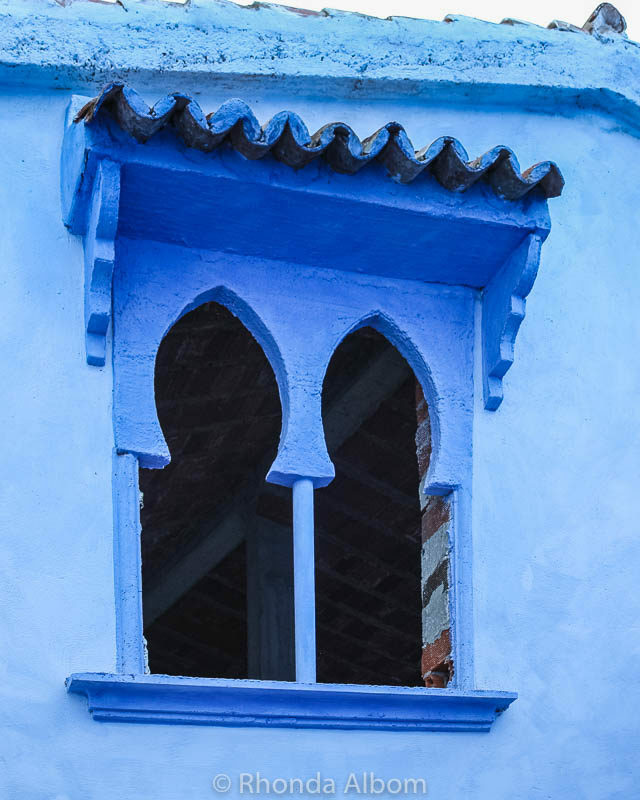 It’s not the entire country, but rather only Chefchaouen is blue. Ah, this is gorgeous photography, Rhonda. Morocco looks indeed like a “blue city”, I’d love to see it too. 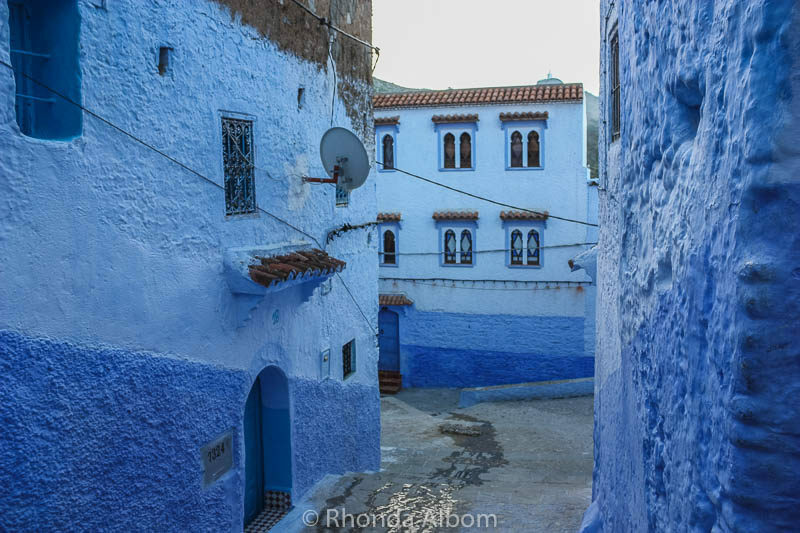 It is only the city of Chefchaouen that is a blue city, although we did see a blue street in Rabat. I loved it too, peaceful is a good word to describe it. LOL – I would love to be there right now too, although, it might be quite cold being winter and in the mountains. I couldn’t find it verified anywhere, so let me know if it works. Wow. That looks amazing and an interesting place to explore. It is beautiful. Choosing only these photos was a difficult task. It would have been some quite spectacular glacier ice to be this white. The blue city is such a beautiful area. I love the blue buildings and the narrow streets – very quaint. Agree. Quaint is a good word for Chefchauoen. This part is a bit more difficult to get to. I love the blues! What a beautiful experience and visit! It is so unique. I imagine I will never forget my time there. I love the bright pigment colours. There is something quite special about them. It really is. Thanks Kathe. So many beautiful and colourful captures. I love the architecture here, and the picture with the satellite dish definitely shows the contrast of new and old. The picture with the paint pigments is really nice. Thanks Jade. Much of Morocco was a mix of the old and new, mostly the old. 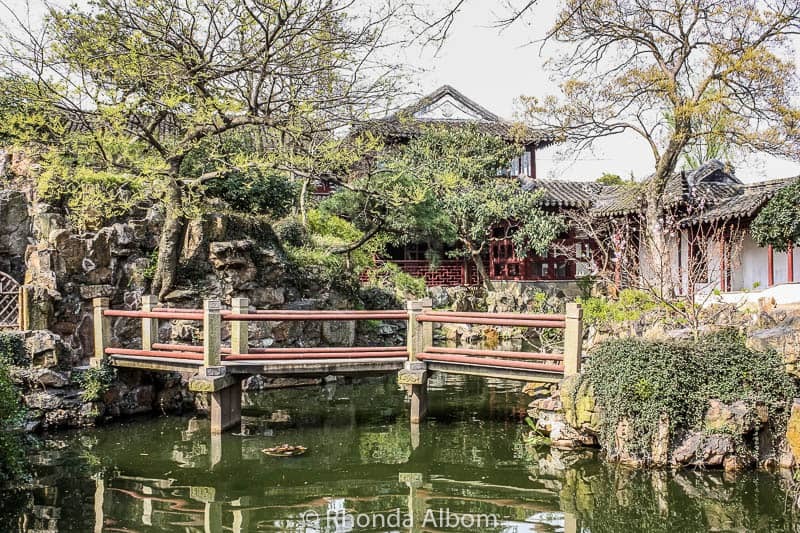 Rhonda, What a fabulous photo journey! 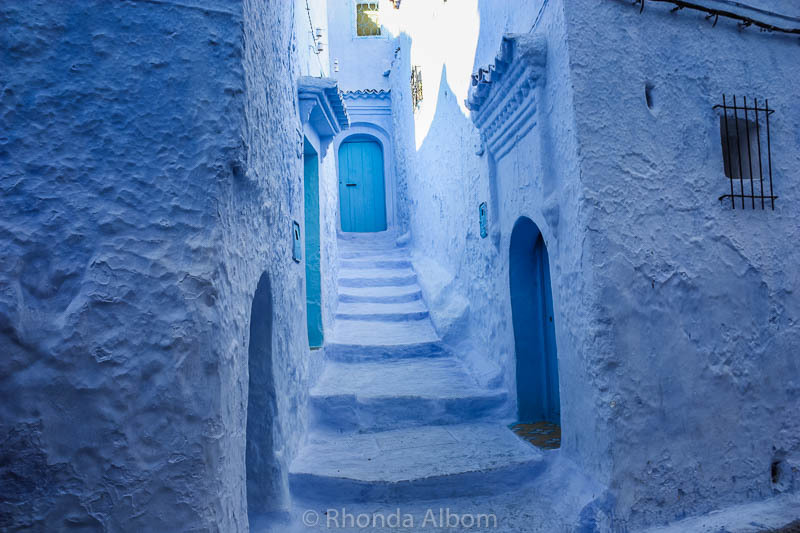 I will never see such a place as the Blue City in Morocco. This picturesque city looks like something one might see in a Mission Impossible or other action flicks. I love the beautifully painted buildings. I smiled to see technology touch this old city with the satellite dish on the side of one of the buildings and then I marveled at the women doing laundry at the waterway. I can’t imagine washing clothes like this and am thankful to have a washer and dryer in my home. lol Thanks for sharing these wonderful images with us on WW, my friend. Have a good day! There is such a feel of tradition when I was there, the idea of an action flick seems completely out of place. But, I can see it now that I look back at the photos. I’d love to live in a city that beautiful. Wow. It’s like the sky and the ocean are all around you. I was really attracted to the blue as well. They picked such a beautiful shade of blue. The whole city’s amazingly clean. Nowhere in Egypt is like that unless it’s a special place for tourists. I love the wall – so medieval! Thanks so much for sharing – this is a very special place. LOL – as far as we know, this is an actual town, not a tourist site. never been there, sigh but would love to. I hope you get there someday. It’s a photographer’s paradise. I cannot wait for my Morocco trip in April. I cannot wait to see this blue town. I loved our time in Morocco. We spent 32 days, and could have easily spent months more. What beautiful pics. I’d never heard of this place. It’s stunning. The train runs from Fes or Tangier to Marrakesh, so the cities along there are most popular in Morocco. This one takes a bit of work to get to. Wow, very beautiful photos. You go to the coolest places. 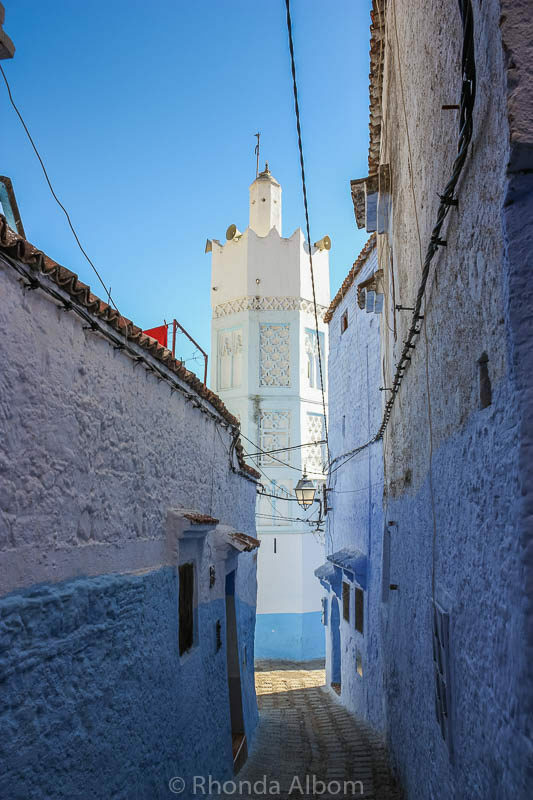 What a stunning city … it will definitely be in my plans if I make it to Morocco this year! It’s quite a bit off the beaten path, and the train doesn’t go there, but it is worth the extra effort. When I saw a picture of Chefchaouen for the first time I knew I had to go there, you fall in love in every picture, every corner is beautiful and there is a paradise to do photos, I really loved it and you have seen it on my posts. You and I are exactly the same. Every corner is magical. I just loved this city. It is an amazing city. I love, love, love all the color. Breathtaking. You’re photography rocks too. Thanks Sandee. Glad to virtually bring you to somewhere I know you will never travel to. …such wonderful blue…and other colors. Beautiful sights. Your pictures are gorgeous. My mother would have loved that city as blue was her favorite color. Everything in her house had some blue in it….too much for my taste but oh how I miss her and wish she and her “blues” were still here. Great photos! Thanks Teresa. I am sorry about your loss. Hope the pictures brought back happy memories. This picture makes me blue. Get it? Sorry about that. I just felt so blue I had to say it. Oh my goodness I did it again. Sorry about that. One thing that bothers me is you weren’t allowed to enter the Grand Mosque of Chefchaouen because you weren’t a Muslim yet if a Muslim were to go into a Catholic church were would be allowed. I don’t get it? Have a brilliant blue Tuesday Rhonda. See ya. LOL – you are too funny to be blue 🙂 As for the mosque, that is how it is in most places around the world. A mosque isn’t a tourist attraction, but rather a place of worship. There are a few we can go into, and we have been in mosques in Muskat, Abu Dhabi, and Istanbul. Such a tranquil city. I love all the blue. I would want to buy all that pigment! All of your pictures are amazing! What would you do with all that paint? What an amazing destination to visit, beautiful pictures!! It’s quite beautiful. Blue keeps mosquitoes away? Good to know. And probably smart to steer clear of the Marijuana plantations. Honestly, I cannot verify that blue keeps mozzies away, but that is what our guide told us. Stunning blues – my favourite colour too. But I love the shot with the bags of paint. A great catch. Thanks for sharing your travels with this stay-at-home. I loved the moment I turned the corner and saw the paint pigments. Blue is my favorite color and I love the color of the buildings – it makes me happy! This is a perfect city for you! 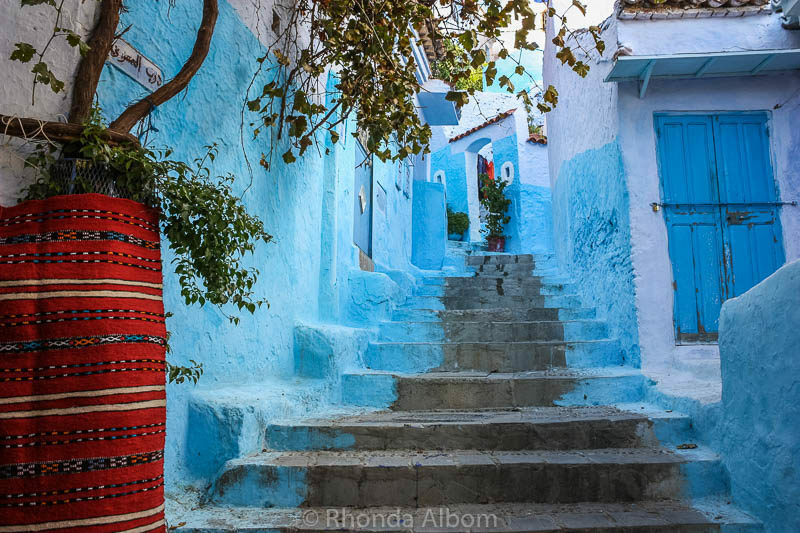 Its a beautiful photo journey along the streets of Morocco.These blue structures are really attractive! 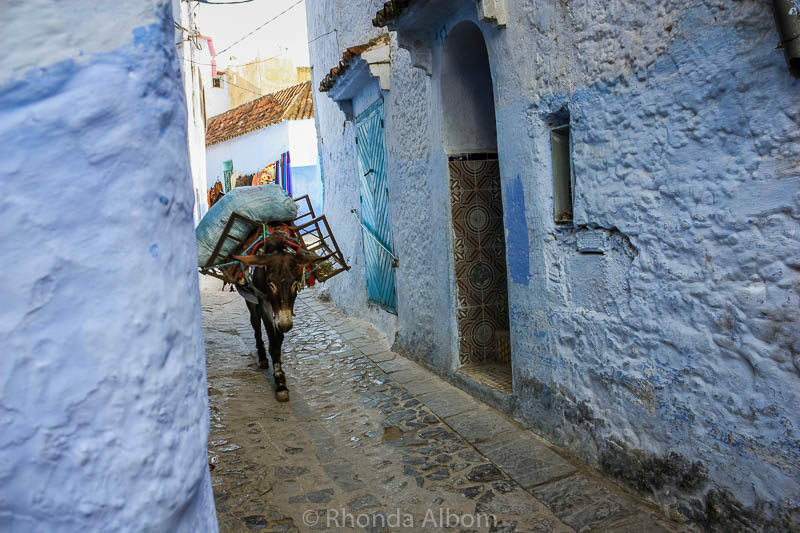 Chefchaouen is not like other cities in Morocco, although we did find one blue street in Rabat. The blue is really relaxing. It was a comfortable place to be. So blue and beautiful.. I love the paint pigment display.. So colorful.. I don’t know why the bright colors of the paint pigment surprised me so much. I really like them as well.